It's been almost twenty years since I first read about a palmtop. I was truly amazed by the idea of a "VHS-cassette-sized", fully functional PC. 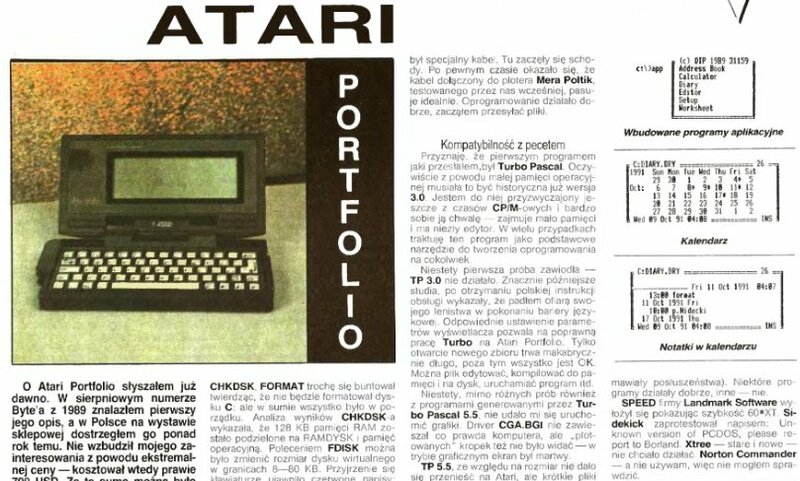 Atari Portfolio became my long unfulfilled dream. As the technology was moving forward, palmtops were more and more sophisticated. HP 95LX had twice as large screen as Portfolio and much more memory, being smaller and lighter. Psion Series 3 introduced graphical user interface and excellent built-in software, including real WYSIWYG word processor. Each year brought new models, new technologies and new possibilities. Today's palmtops have more processing power than a workstation of that time. Thay can display 24-bit images on their high-resolution touchscreens and play mp3s and videos. You can surf the Web with them, connecting to the wi-fi or 3G Internet. But they lack one thing. They can't be easily "hacked", "tweaked" and "modded". Their users don't write programs for their own purposes; after all, these computers are more difficult to program than MS-DOS compatible Portfolio or Psion with its own, built-in OPL programming language. Palmtops became tools - when one doesn't meet your expectations, you simply buy a new one. I hope this blog will be useful for those who still tweak their own vintage jewels and have fun with it.